This cake is the 2009 edition of the Red Yiwu produced by the Yu family in San He Village in Yiwu. Tea farmers usually do not store their teas for aging but there were a few tongs of this tea left at the daughter’s tea shop in Kunming. When I smelled the cake before unwrapping it, I was struck by its fragrance. Upon brewing the leaves, I was both surprised and rewarded by the camphor and honey scent. 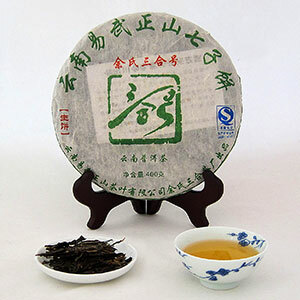 The tea is perfectly balanced and leaves a pleasant mouthfeel and a comforting cool sensation all over the mouth cavity. Smooth and silky, the tea flows softly and gently down the throat. Although I was not able to buy this tea in quantity, I feel privileged to own such great tea. If a good tea has the ability to rid us of our worldly stress, this tea certainly can. Use 5g of leaves per 5-6 oz of water. Rinse with boiling water (212F/100C) water and discard the water. Begin brewing with 195F/90C water and follow the suggested steeping times below.